I don't like the idea of placing baby in a Pack 'n Play for play time; the area is so small and confining and so sleep-like, that it just doesn't seem very nice. Let's face it -- playpens are sooo last century. With our first child, I didn't really see the point of a play yard; everything on the floor or on the bottom shelves of bookcases were age-appropriate and safe. But Baby #2 lives in a big kid's world now. The floor is littered with Legos, markers, rocks and leaves, and teeny tiny pieces of paper (oh, how Hila loves cutting!). An exersaucer is one idea, but for a very active 6-month-old, it gets old after a few minutes. This is a baby who likes to explore every inch of the floor. And that's another point -- baby's put in a Pack 'n Play for play time don't get that very important developmental floor time. You can't learn to crawl in a padded crib. You don't get the experience of exploration when you're surrounded by four walls in a small space. The following "play yards" or "playards") enable you to put your baby (or even toddler) down on the floor with enough room to move around and explore, without feeling confined or restrained, or at least not very much. 1. Pavlov's Toyz Electronic Interactive Activity Baby Playpen -- This is for the parent who seeks the most colorful of baby things with the most bells and whistles. Why put your baby in a boring playpen when you can put her in a fun (and noisy) one? 2. 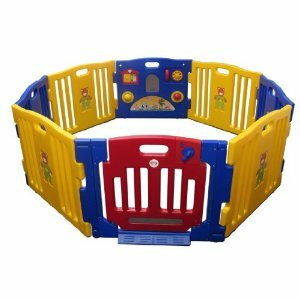 New Baby Kids Playpen 8 Panel Play Center Safety Yard -- This is probably the one I would choose. The gate panels are colorful and have some (non-noise) activities on them, and can be arranged in whatever shape/configuration that suits you/your living room. You could, for example, block off the area where your 2.5-year-old is doing the paper cutting, allowing explorative access for your 6-month-old to the rest of the house. Teach your 2.5-year-old how to open and close the gate and let her know that no bits of paper can escape the gate. 3. 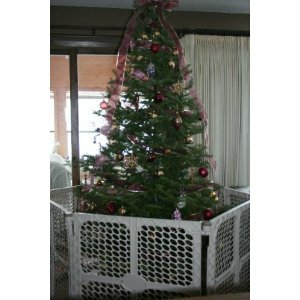 Summer Infant Secure Surround Play Safe Play Yard -- Here's a good bare-bones gate that you can place either around the baby's play area or around a do-not-touch area (see Christmas tree left -- I didn't see a picture of a playard surrounding Chanukah candles, but that would work too). You can buy additional Summer Infant Gate Panels to extend the inclosed play space. 4. 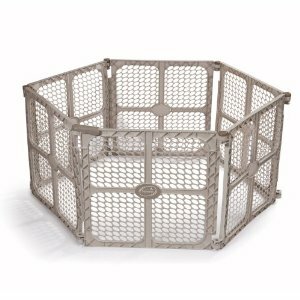 Versatile Play Pen -- Here's an option for those with lots of space. 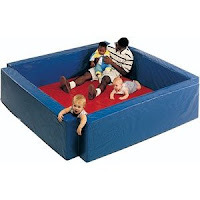 With 16 panels you can really create a huge space for your babies or kids to play safely. 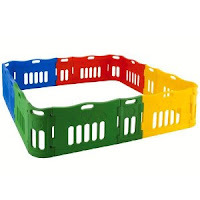 This would be great for creating a safe play zone outside. 5. 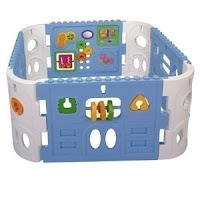 Children Factory Infant Toddler Play Yard -- For the parent who wants to bestow a more luxurious play space. 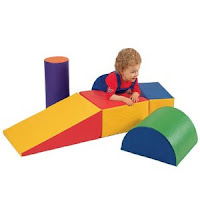 Of course, you don't get the kid-to-floor contact that I think is important, but you could put some really fun gymboree play toys in here (like those soft foam jungle gym things) and your big and little kids would have a blast. (I like how this one doesn't have a cage-like feel to it.) Um, okay, I want this. Anyone have $700 to lay out for me?